Whether you’re a homeowner or business owner, 911 Restoration believes in providing a Fresh Start. While this usually means restoring a property, our franchise branches also take pride in serving the local communities of which they are a part of. This month we highlight 911 Restoration of Imperial County, one of our Southern California branches based out of El Centro, CA. Franchise owners Claudia and Joe Parra have been a part of 911 Restoration for about a year now and as their business continues to grow, so has their popularity in their local community. That’s when they decided to host their own Community Business Showcase, with the goal of connecting small local business owners while giving back to the community. “Within a few days I had more than 20 local vendors signing up. Even our kids offered to help out by posting flyers around our neighborhood!” says an excited Claudia. The best part about the event, it is completely FREE to attend. Over 20 exciting local vendors will have booths with information as well as new products for you and your family to check out. There will be complimentary refreshments and fun prizes given away as well, and maybe even a few surprises! 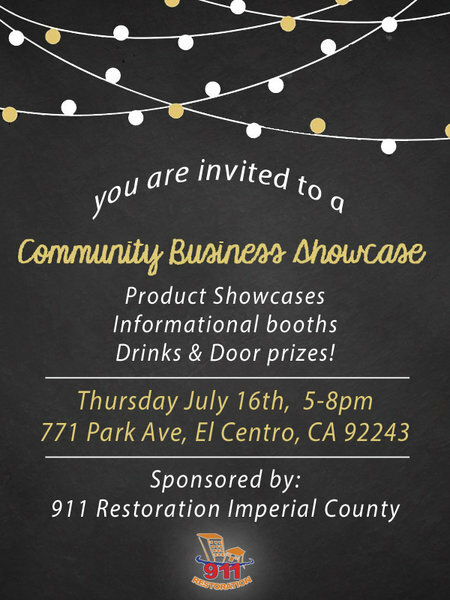 The Community Business Showcase takes place on July 16, 2015. Door opens at 5pm and the event ends at 8pm. The address is 711 Park Ave. El Centro, CA 92243. Join the Facebook Event and call Claudia Parra (760) 233-6275 at for any additional info.